With the baby now due in 1.5 weeks [not that anyone's counting...], my husband and I took the opportunity to have a little "babymoon staycation" last month. While C hung out with her grandparents, we stayed at a hotel downtown and enjoyed our city, doing things we haven't been able to do much since C came along. The first night found us dining at Modern Cafe in NE Minneapolis, where we stumbled upon Art-A-Whirl. Turns out we picked just the right weekend to tour hundreds of artist studios and see lots of great work. I have a certain weakness for journals, and today's featured artist really tempted me to add to my collection. Wayfaring Art is her name, and handmade leather-bound journals are her game. You really need to check out her gallery to see the breadth of her work. The earrings shown above were simply too irresistibly cute not to share! Her full-size journals have a great earthy, rustic vibe. They feel like something a backpacking traveler would carry around, recording their discoveries and experiences. Those in the area can see her in person at the Edina Art Fair this weekend, or she's on Etsy, too. Seriously. 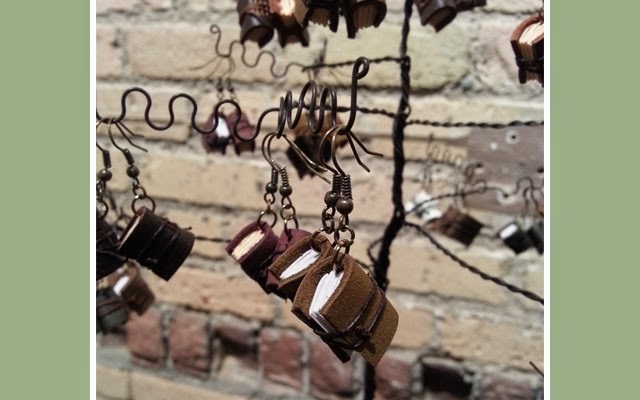 Doesn't every bibliophile in your life need those earrings?